We’re all familiar with Shakespeare’s face, although it’s often said that we don’t really know what he looked like. 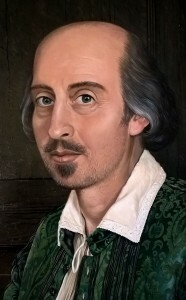 Every now and then someone will proclaim another painting to be an original portrait of Shakespeare, newly identified. 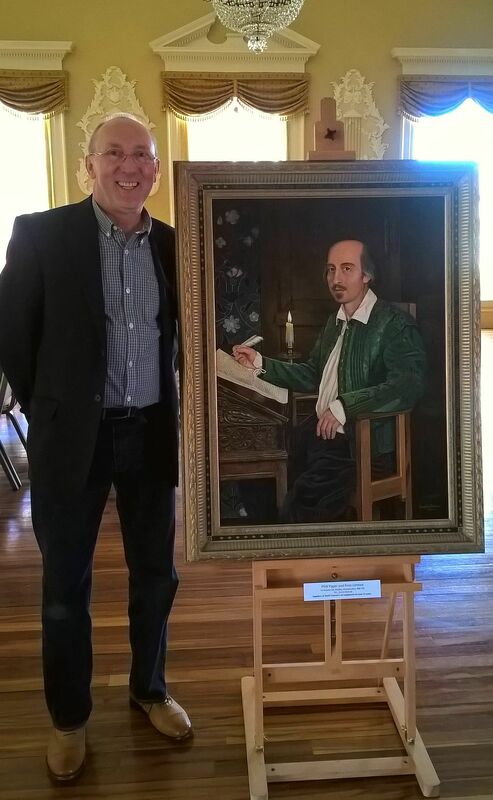 A new painting, created to mark the 400th anniversary of Shakespeare’s death, has just been revealed. Rather than elevating him to the status of a god, as some have in the past, this one aims to make Shakespeare as real as a man you might see down the pub. It’s been created by well-known artist Geoff Tristram, and I was lucky enough to be invited to Stratford’s Town Hall to take a look at it, and to meet Geoff for myself. Geoff is an illustrator, portrait artist and cartoonist who’s worked for companies such as Cadbury’s, Penguin Books and the BBC, and is based in Stourbridge in the West Midlands. His designs have been seen on postage stamps, greetings cards, jigsaw puzzles and fine art prints, and he also has a great interest in portraiture. He also spends a lot of time visiting schools and colleges to inspire students. Geoff has done a great deal of research into coloured portraits of Shakespeare such as the Church bust and the Flower portrait to make his image as lifelike as possible, but the overwhelming impression of the painting is that it’s the Droeshout engraving come to life. Whereas older paintings that purport to be Shakespeare rarely look as if they are of the same man, Geoff’s painting has an air of comfortable familiarity. 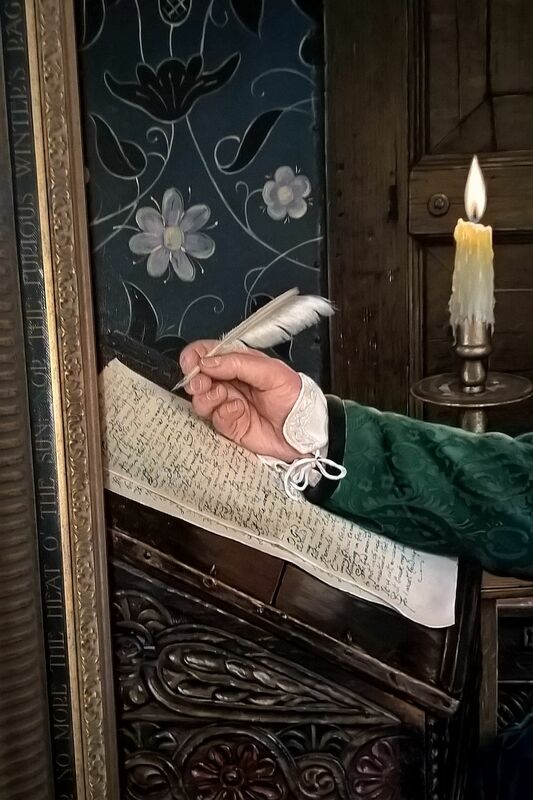 This Shakespeare, though, also looks real, from the beautiful quality of the painting – you feel you could touch the hand holding the quill, to the intelligent expression in his eyes. Geoff has approached the painting meticulously, and Shakespeare buffs will enjoy spotting the visual references: on his left hand is the gold signet ring found in the early 1800s inscribed with WS; the background is copied from wall hangings in the Birthplace, which were in turn inspired by contemporary hangings elsewhere; and the speech which he has just written on the paper in front of him can be read: it’s Hamlet’s first soliloquy on the subject of mortality: “O that this too, too solid flesh would melt”. 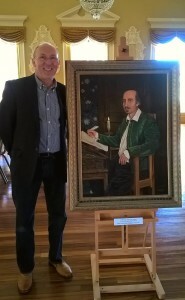 The painting has the support of Stratford’s Town and District Councils, and will be on display in Stratford’s magnificent Town Hall during the Birthday Celebrations in April after which it will be sold. During the Celebrations on 23 April 2016 15,000 masks, based on Geoff Tristram’s portrait, will be distributed to the crowds in the streets. Signed limited edition prints of this fantastic image will also be for sale and it’s hoped that the money raised will help to fund the Celebrations of Shakespeare’s Birthday into the future. This entry was posted in Legacy, Stratford-upon-Avon and tagged Geoff Tristram, painting, portrait, Shakespeare's Birthday Celebrations, Stratford Town Hall, Stratford-upon-Avon. Bookmark the permalink. Intriguing article and sympathetic portrait. Will see if I can get to Stratford during April to see the portrait “in the flesh” before it disappears to (presumably) the US or the Far East…. Glad to hear you may try to see the real thing: it’s beautifully-painted! I didn’t get a chance to look properly at the limited edition prints but they are very high quality copies of this painting. You’re welcome Geoff it was a privilege to get a preview of the painting and a delight to meet you!